Students will learn how to use the arts for the Gospel, through a creative process in the workshop and in practical application in ministry. Students will learn basic techniques for drawing and painting. This course inspires students who are artists or creative individuals, encouraging them to be more effective in how they manage art to reach the lost in a creative way. Students will learn to express God’s love through prophetic and creative painting, inspiring them to seek God. We will work in teams, forming creative groups to develop redemptive art. Carlos is a Mexican visual artist specializing in the disciplines of painting, sculpture, and graphics. His works have been exhibited in different galleries in the United States and Mexico. Some of his unique creations are permanently exhibited in the Northeast region of Mexico. Cázares received first place honors at the Sculpture Biennial sponsored by the Institute of Culture in Sonora, Mexico, in 2001. Through his art, Cázares seeks to expose his heart to the light of the Creator, and constantly seeks a way to impress the life of God on his canvases. 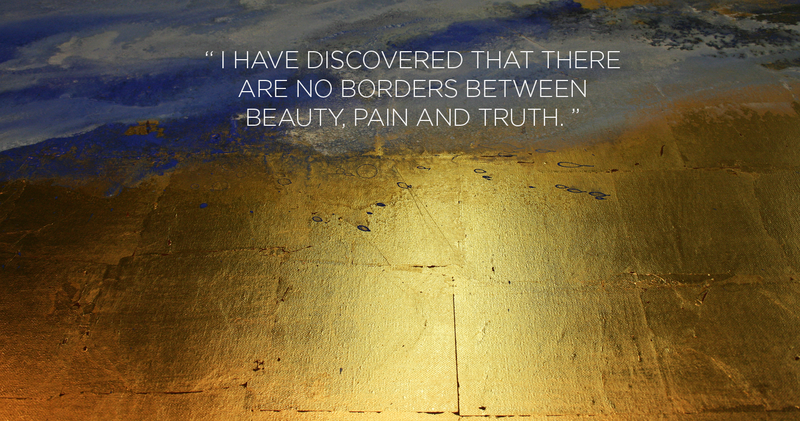 Through his experimentation with pigments and mineral deposits, he has found that materials such as gold and silver offer a beautiful refraction of light that enriches his work. His abstract works reflect his appreciation of ancient techniques and his pursuit of applying them in a contemporary setting. Cázares is a visual graphic artist at Christ For The Nations Institute, where he teaches art instruction. He is also a curator and a board consultant of Renacimiento Cultural Foundation and a member of the board of Walk the Light Foundation in the city of Dallas, Texas. The first time, among thousands of people who gathered for a concert. He went up the stage with a chair in his hands for one of the artists, who was pleading for a shining armor who would rescue her from fatigue. In those days he already knew how to fly. The second time was at a Vladimir Cora exhibition. We agreed on his work and after that in our interests and goals. The bond that emerged in the middle of color and texture, shape and backgrounds, have remained against time and not only that, but have grown stronger regardless of distance. The year 2001 was beginning. During this period, Carlos considered himself as a beginning artist. He never said so, but his humbleness did. He knew about his talent, because the Spirit invaded his being from head to toe, and in countless occasions I heard him say it was “by Grace”. But I also understood that he needed the next step. To increase his knowledge in the technique and to break that barrier of fear that is so common in us as human beings. He was participating in a workshop for abstract painting with Professor Jordi Boldo, who visited Hermosillo, Mexico, as a Guest painter by the Cultural Institute of Sonora, (Instituto Sonorense de Cultura). During that time, he related with outstanding artists from Sonora, and had a chance to share his interests and recognized that feedback is imperative in developing as an artist. He had previously taken some courses and workshops for welding in San Diego, California, drawing of human figure and etching, with Roberto Parodi and Antonio Pazos, in Hermosillo. His prior Academic formation took place in Bribiesca Art Institute in Guadalajara, Mexico, where he graduated as a Graphic Designer with a specialty in Illustration, and built the first tangible bridge with the visual arts. The intangible connection was inside of him, this was encouraged by his family from his early years. A restless and industrious person under disciplines; with the best nature o fan artist. To break molds and paradigms in search for his own style is part of his life. This is Carloz. Painter, sculptor and designer. In his brilliant path, he has incorporated the knowledge that comes from the light and has discarded anything that interferes with his growth and the path his walking on. He learns, enriches and delivers a consolidated work to the spectator. Nobody knows the hours of invested effort, but we all feel the strength that we can see in the canvass, wood or metal. We imagine a posible interpretation. Our perceptions defer, but in the end we have the certainty that the piece we have before us is worthy of contemplation. Carlos Cazares travels from figurative to abstract. He has not detached himself completely from recognizable forms although he has decided to distort them to the human eye to show that the identified forms are unnecessary in the presence of God. The sense of his work goes beyond any practice, school, or technique. Generously projecting an orientation to wisdom and showing his position in this world and the inevitable commitment with the Truth. 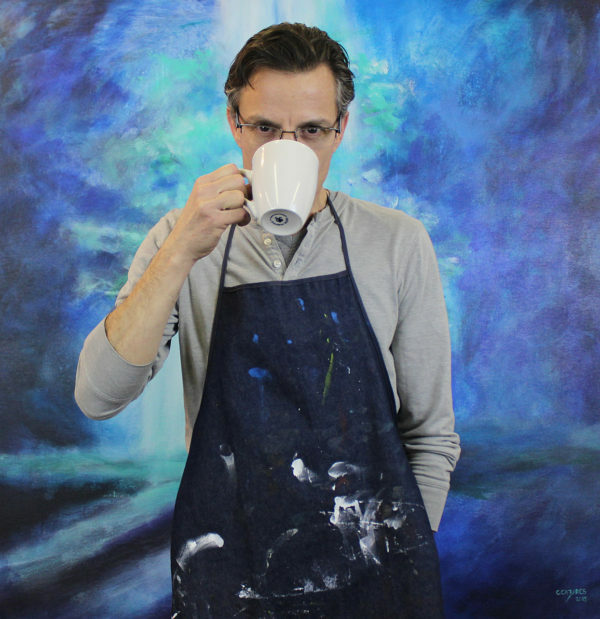 He has dedicated himself to create a high quality work, through the research of different techniques and the search for expression, with the purpose to evoke subjects that will touch the deepest part of the human being, both spiritually and emotionally, through different disciplines like sculpture and painting. He is quite convinced that talent is a gift from heaven and must be well used in relationship with his environment. Should be multiplied, and to give that gift back is his compromise. Using that gift to talk about his relationship with God is a necessity. The sculpture and painting of Carols Cazares have been exhibited in different spaces of Sonora and Jalisco, in Mexico; also in Indianapolis and Arizona (Museo de Arte Chicano), in The United States. His work is permanently exhibited in Hermosillo, in Sinomex an Israelite Company (sculpture in metal, 1999); Instituto Alerce (sculpture and mural, 1999) and Gándara Hotels (sculpture in metal and stone, 2000). With his work “21 shots and still alive” (21 tiros y aun vivo) Carloz won the State’s 2001 Biennial for Sculpture, sponsored by the Government for the State of Sonora through the Instituto Sonorense de Cultura, in November 2001. He also obtained first place in the Contest for the design of the Gulf of California, sponsored by the WWF.GCP (Guaymas, Sonora, Mexico). He integrated the following individual collections: Graphics in black ink, WWF (1999); Silence of life (painting and graphics, 2001); let there be light (object art, sculpture and painting, 2002) and Paradigms (object art and painting, 2003), which found worthy spaces in San Carlos and Hermosillo, Sonora, Mexico, and in Phoenix, Arizona, United States. In each of these collections, titles, color and form found a direction and in this process Carloz was affirmed as an author. Carlos Cazares is in constant movement. His artistic work began to show since 1998. His missionary work would show three years later. Up to this date he has been able to harmonize both passions, and make them part of the same goal: expression. An inherent need to the author and a job of the disciple. Through sculpture he has been able to calmly develop his gifts, without pressures, unlike painting, for he suffers in conceiving each painting and he tears in the beginning, although after he owns the canvass, he transforms it, and makes it his own. Later peace comes to him… balance. In “de la vida” (From Life) the author describes the depths of the human being, through carefully and peacefully examining, in a state of contemplation, the contradictions of our human nature. With his three-dimensional work “Sea la Luz” (Let there be light), he signed the path that he is walking and showed to the spectators the inevitable metaphor: the honesty, durability and transcendence of the metal, in representation of the life in Christ. The “Paradigm” collection was, in a paradox the breaking of molds and established mindsets. In search for the only model to follow, the One who gives life and transforms. After his Missionary trips to Costa Rica and India, Carlos has evolutioned considerable in every aspect. Body, soul and spirit have been fortified in one goal: to give. At his return, all of that internal fire has been, put into his artistic work, where he moves with love to his neighbor and love for God. Before the age of 40, Carlos started the “40 Menos uno” collection (40 less one). The passion for the passion. In each piece, our sight can find a triumphant red over darkness. A rich scale of red that manifest his knowledge, dominion and application of color and technique, but above all, his certainty that this artistic representation of the lashes upon the Lamb, bring the spectator the opportunity of hope for a path that leads to the light. There are no brush strokes; there are only strokes, lashes. The entire body of the author in this piece, experiencing pain. The suffering of the artist in relation to the suffering of Christ, evoking the hour when real freedom for the human race began. It is not a posture, is a decision. Carlos believes in Grace which has given him the opportunity to express the gifts and talents that “Cannot be kept in hiding. Chicano Art Museum, Phoenix, AZ. Centro de las Artes, University of Sonora. Casa de la Cultura, Sonora, Mexico. Instituto Alerce, Hermosillo, Sonora, Mexico.